In the last few years, fitness center memberships have dropped in price due to increasing industry competition. To stay profitable, gyms must serve hundreds of clients with a small staff, and our example gym is no exception. The gym’s owners knew that it was easier to increase their earnings by delivering additional services to established members as opposed to attracting new members. Therefore, they opened a convenient on-site child care area and hired several contractors to provide services such as personal training, massages, and nutritional guidance. The 24-hour gym had four full-time employees, three part-time employees, three childcare workers, five freelance personal trainers, two self-employed massage therapists, and a nutritionist. The couple who owned the four year-old company handled all the admin responsibilities with paper timesheets and Excel spreadsheets for scheduling. When the gym expanded their services, the sudden influx of additional staff members and contractors significantly increased the complexity of scheduling, compliance, and payroll. Manual processes were taking too much of the owners’ time and there was a lot of employee confusion when it came to scheduling and time card management. The owners were excited to completely scrap the old school paper timesheets and establish new, efficient Workforce Management processes from the ground up. Workforce Management Suite consists of TimeWorksPlus, TimeSimplicity, TimeWorks Mobile, and TimeWorksTouch. These integrated tools streamline the relentless, tedious tasks inherent in managing time cards, creating and adjusting employee schedules, tracking accruals, and ensuring compliance with regulations. And to sweeten the deal, the system reduces labor costs every single pay period. 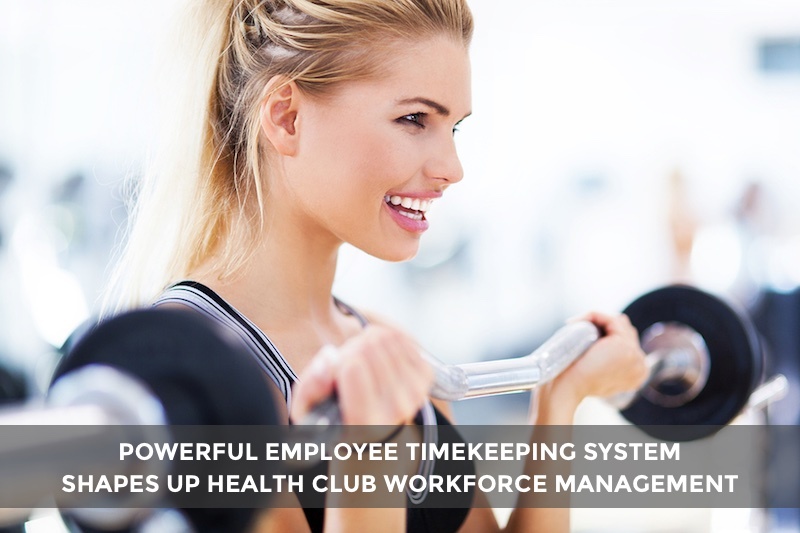 The owners had mistakenly presumed that implementation and needed training would be a lengthy process due to the impressive multitude of tools and features contained in the health club employee timekeeping system. Thus, they set aside a day and a half to learn the system. When they saw that it was basically plug-and-play and as intuitive to use as their favorite phone apps, they were pleasantly surprised. Within 20 minutes of set up, they had documented all the employee and contractor information, assigned job codes, set up overtime alerts, and created two months’ worth of weekly schedules. Employee scheduling confusion has been reduced with the Virtual Trade Board which simplifies shift trades and automatically alerts the affected staff members when a manager approves a request. Employees can look at their schedule, time cards, and accruals at any time. Shorthanded shifts and scheduling mix-ups are now a thing of the past. TimeWorksTouch has done away with missing and unmatched punches with its “employee-aware” technology. Approving time cards and administering payroll is a snap and everyone is happier. Five weeks after the transition, the owners had reduced admin time so significantly that they were able to start devoting many hours a week to marketing projects that had been put on the back burner for months and they are even talking about opening a second location.